Jorge Ignacio Fernandez was 9 years old in 1966 when his family fled Cuba incognito with three suitcases, three kids and three dollars, winding up in Miami by way of Jamaica, and ultimately himself to the Philadelphia area. His father had been Agriculture Minister in the Fulgencio Batista dictatorship. Then came the communist revolution and word was out that he was on the list to be arrested. Before, they had a nice life — millionaires, limousines, nannies, private schools. Now it was riches to rags, but ultimately like many of the early Cuban refugees they found their way back to prosperity after initial hardships because they were from the educated class – doctors, lawyers and other professionals. Now after more than half a century of not speaking, Cuba and the U.S. are finally coming to terms. The past is the past and it is time to move on, to reestablish diplomatic relations and possibly to lift the trade embargo that was put in place after American companies had their Cuban assets seized after the communist takeover. For his part Fernandez thinks it is about time. America has diplomatic and trade relations with many countries with policies it does not support, why not Cuba? This thaw in relations between the two countries doesn’t mean there would be an exodus of former refugees back to Cuba, because those who came are happy to be here, Fernandez believes. Some may want to buy a second home there or perhaps be buried in the family plot, but that’s as far as it goes. Fernandez himself has done very well in America. He had a strong career as a group president for Estee Lauder, and also through real estate investing. Probably Cuba would benefit from this new relationship, with possible resumption in traditional trade in such commodities as sugar and cigars, along with an increase in tourism. Before the revolution Cuba was a favorite American vacation spot and it could well become so again. 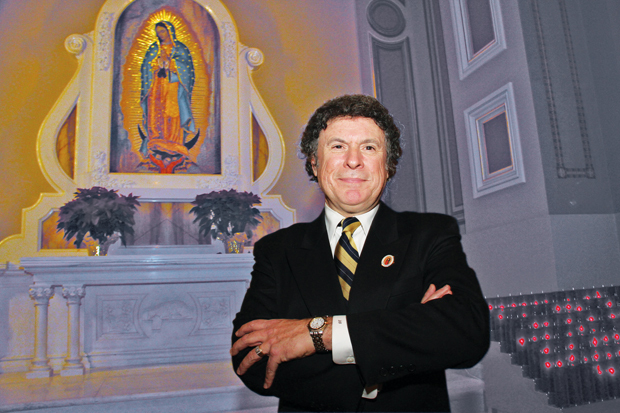 A devout Catholic, Fernandez was for years a member of Our Lady of Mount Carmel Parish in Doylestown, where he and his wife Pamela raised their three children, Jennifer, J.C. and John. They have more recently been part of the Our Lady of Guadalupe Parish in nearby Buckingham after the new parish formed. He is a member of the Archdiocesan Pastoral Council that was established by Archbishop Charles Chaput, and is the archdiocesan Leader of the Catholic Association of Latino Leaders (CALL), a group co-founded by Archbishop Chaput that is headquartered in Los Angeles. In spite of the lack of formal diplomatic relations and the ongoing trade embargo, travel to and from Cuba is not as impeded as one might think, especially for those who are Cuban-born or involved in cultural activities. Fernandez has been back to his land of birth many times, and took the Philadelphia Boy Choir, of which he was a board member, to Cuba three times — in 1999, 2000 and 2001. Although there was clearly repression of all religions in Cuba in the years following the establishment of communism in the country, Fernandez said at no time did he ever find a difficulty in attending Mass during his visits. There was a definite thawing of church-state relations in the 1990s, first from a visit by Fidel Castro to Pope John Paul II in 1996 and two years later from a visit by the pope to Cuba. 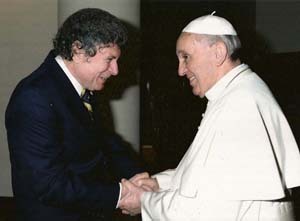 Fernandez also traveled to Cuba in 2012 when Pope Benedict XVI visited the island for the 400th anniversary of the discovery of the icon of Our Lady of Charity of Cobre, the patroness of Cuba. By that time Raul Castro had succeeded his brother as president and there were noticeable changes happening that are continuing today. For example, now Cubans may buy and sell houses or automobiles, small businesses are springing up, and although the U.S. still forbids American-born citizens to visit Cuba without special permits, Cuba places no such restriction on its own people. They are free to travel, with a visa to visit any country including the U.S., Fernandez said. In 2013 the leaders of CALL were scheduled to travel to Rome for a meeting at the Vatican and during their stay live at Domus Sanctae Marthae (a.k.a. Casa Santa Marta), the recently built guest house in Vatican City. Two weeks before the meeting Pope Francis was elected and chose to reside at the residence himself, rather than the more elaborate Papal Apartment. The CALL delegates assumed they would have to stay elsewhere but word came down that Pope Francis would be delighted to have them at Domus Sanctae Marthae. During their week-long stay they met the pope informally each day and there were many discussions including the status of Cuba. “In his words, the Holy Father said, ‘the world must open up to Cuba and Cuba must open up to the world,’ and he is leading the charge,” Fernandez said. There is no doubt in his mind that the subsequent meetings and correspondence Pope Francis had with Cuban and American officials including Castro and President Obama are the most important factor in the current thaw in relations between the two countries. “Pope Francis is a blessing,” Fernandez said. I have great respect for Pope Francis. He is a breath of fresh air. However, on this issue, I respectfully disagree. Since the price of oil has dropped and Cuban patrons like Venezuela are on life support, we had a chance to rid this hemisphere of communism in Cuba. The Castro brothers have no intent of change from their repressive governance. This is a mistake for President Obama and also for Pope Francis.